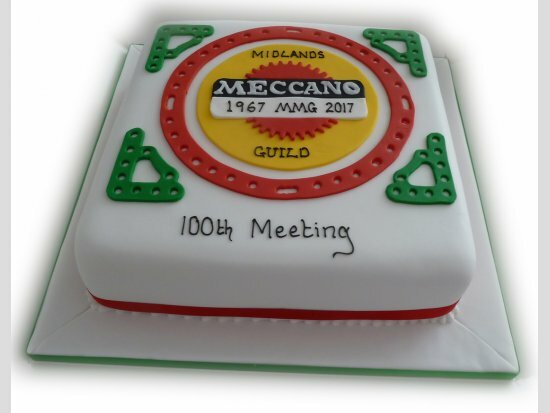 MMG entered its 50th year with the March club meeting at our usual venue, near Coventry, on a lovely spring day, bright sunshine and a good turnout of members. 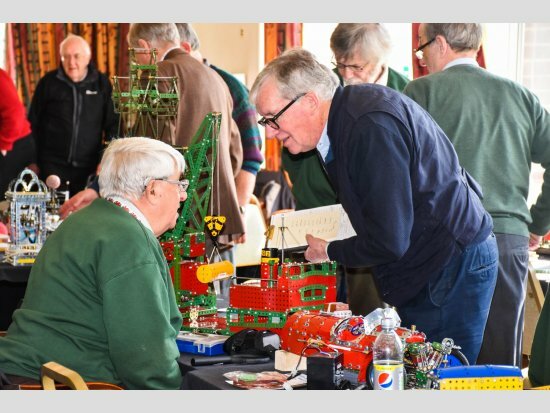 The large number of members attending the 100th meeting resulted in the usual high number of splendid models and historical displays. 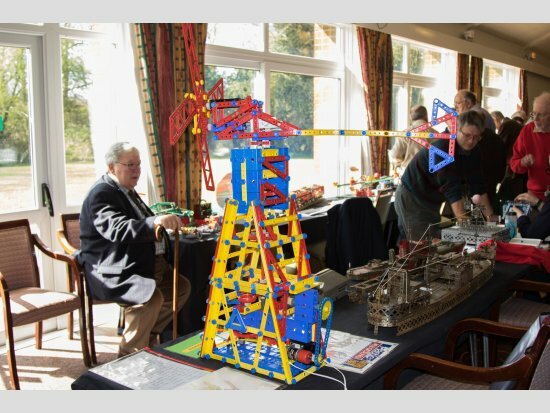 Over the years MMG members have produced an outstanding selection of models and at every club meeting there are models to be admired from those relatively small in scale to those that we wonder how they can find houseroom at home. The meeting was supported again by our hard working kitchen brigade who produced an excellent lunch. We also enjoyed a special celebration cake. Bob Thompson was supported by his daughter, Jenny and friend Richard Kenyon, together providing an excellent photographic team to record the meeting and the models. The MMG is unusual in that chairman George Illlingworth still conducts a model tour in which he draws attention to the particular features of each model. This is quite a challenge, not only to ensure all models are covered but in the short time available to get to grips with the intricate mechanics of some models. We welcomed new members: Chris Dove who showed an impressive model of a Land Rover( described later), and Peter Austin from Henley. It was a pleasure to see Stephen Wilson, who has been unable to attend for a number of years due to a long term illness and is no longer able to drive. Stephen was accompanied by his wife, Valerie, who took the brave step of joining: saying : “ I might as well as I will be bringing him anyway”. We look forward to seeing them both at future meetings. We were also delighted to be visited by David Goodman. David a founder member of MMG and indeed the only living member of Esmond Roden’s initial house group meeting which pre-dated the formation of the MMG in 1967 was welcomed to the meeting during the afternoon session. As always reporting on the models is a challenge and inevitably there is not enough time to record all the details, so the report gives only an overview of what is presented. However some members have helpfully provided comprehensive descriptions of their models, which are included in later sections of the bulletin. The secretary is always pleased to receive material to augment the meeting report. David Goodman is seen right with his son Matt looking through Bob Thompson’s photo album of MMG models over the last 50 years. 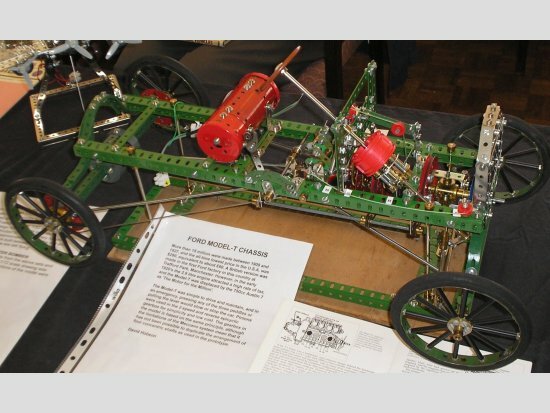 Matt displayed his showman’s engine model and alongside it he had bought along his father’s model – the Electric Mantle Clock based on a design by Ron Fail and was I believe first displayed by David at the meeting in March 1969. 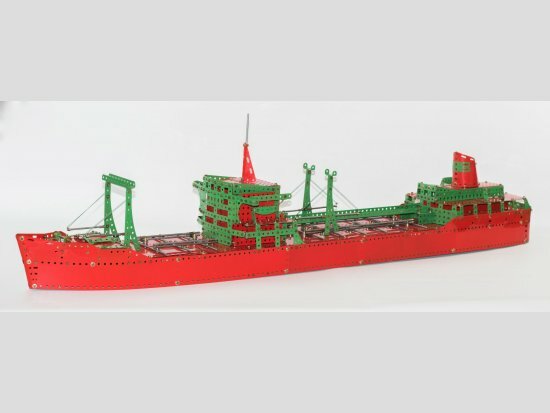 John Nuttall, in a key corner position, presented his impressive Oil Tanker model which seemed almost exactly as detailed in the original December 1956 Meccano Magazine article. This is a very attractive design with a clear representation of the length and proportions of the original. The layout of the super structure and the stern has many elegant details. John used his favourite light red green and had taken great care with selection of the parts. He said that finding good quality and identical appearance rods, to be laid out on the deck, was challenging. As with a number of the other modellers, I had not spoken with our Treasurer in detail previously. John explained that he has been a MMG member since 1972 – 45 years. Another of my questions – “how long did it take you to make the model”? John said about 2 weeks. Quite formidable! Next to John was Terry Allen with his 1914 Swiss Piccard Racing Car (seen left). As described last time, this model is of course a masterpiece. Terry explained that since its last appearance he has updated the radiator and bulkhead and has started the bodywork. The engine has been completed. We are fortunate that Terry continues to exhibit this model so that we can enjoy the complexity of its design and build. Ken Senar. Garbo Truck. This represents a typical Australian garbage collection vehicle for which the driver is the sole operator controlling the automated lifting from the road side of the wheelie bins and all other operations. This monster model weighs 32kg and is a most imposing sight. Nine electric motors drive the full range of functions including bin raising and emptying, opening tail section, tipping body with internal paddle as well as two forward and one reverse gear. Ken explains that modelling took 12 months and all functions can be demonstrated. 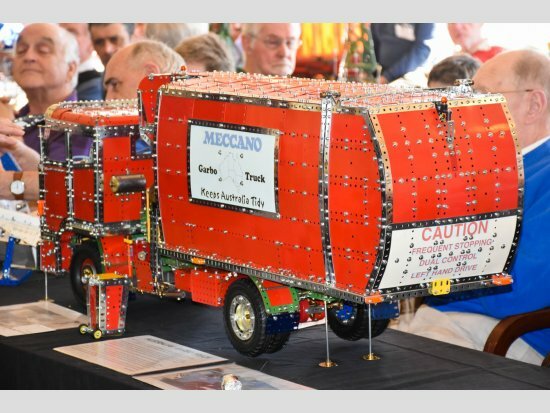 Colin Bull featured a very new model from Meccano – the 787 Dreamliner. Colin had to purchase this from the USA as it is not yet available in the UK. The full cost including delivery and duty was £50. He feels that the model is fair / ok but he would not buy another. The scale is the same as the very nice Concorde model he also displayed. The almost entirely plastic body of the 787 and slightly strange colour of white is obviously quite unlike conventional Meccano. 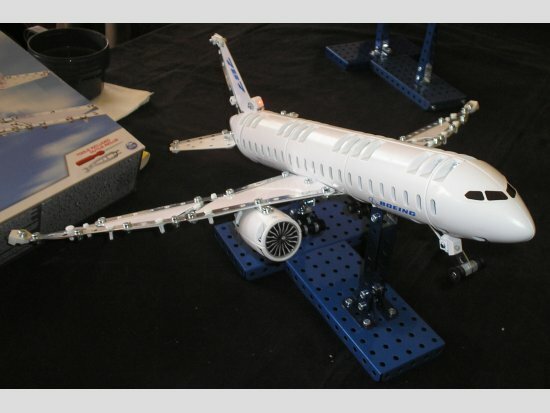 But to build a jet aircraft in classic Meccano would result in a pretty large model. Colin also had the latest Chinook Helicopter model which he was very pleased with. It includes new very tiny contrate gears which drive the two rotors in opposing directions. Finally, Colin had modelled the Bruce Geange 1939 Leyland Fire Engine which was published in September 2016 CQ. This is an attractive small model which has a really cute detachable ladder. Philip Drew (seen left, alongside Paul Merrick) displayed his model “Just a matter of Time”. It is built upon 37 pairs of 1:3 gears (19/57) which are turned by a 60rpm motor. This final shaft is therefore set at the age of the Universe. Also on display was his MECControl computer controlled crane. The software enables multiple movements to be controlled in an ordered way. The movement of each part can be controlled by micro switches and monitored by potentiometers. Stopping and starting can be smoothed and precise. Paul Merrick ran his Ball Roller all through the entire meeting. This is closely based on Guy Kind’s design which was displayed at Skegness and described in CQ 112 June 2016. There is also a You Tube of this model. Guy Kind writes that “ball rollers are very difficult to describe in writing” and, indeed, this is correct. It is a really spectacular model which has many moving parts and has many actions which are very unusual in their function. 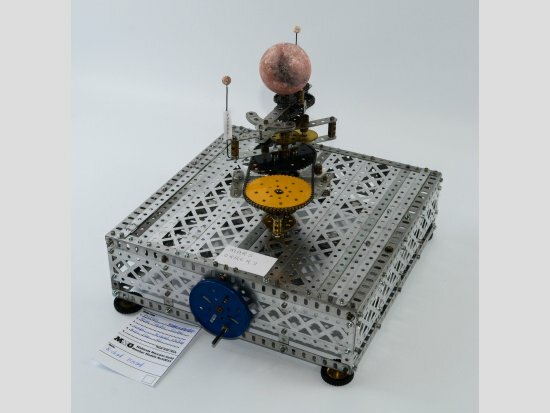 George Illingworth in his afternoon talk accurately described this model as “mesmerising”. Paul explains that there are at least 10 major functions, one of which, the Theo Jansen mechanism, is hard to even understand what it is doing. The model has at least 30 steel balls which ran almost faultlessly. 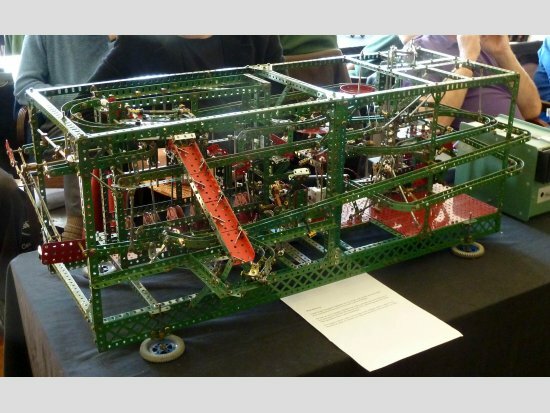 Traditional Meccano designs used Table Tennis balls for such machines but Paul considers that because they are so light they often do not run very reliably. 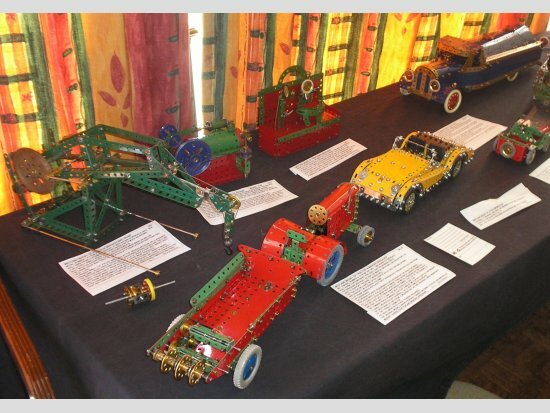 Paul explained that he has only been building Meccano models for three years. John Reid displayed his submarine which he had completed as part of the Spanner Christmas competition. It presents a clear sense of the size and appearance of these vessels. It is developed from the 1940 manual and includes several enhancements. Previously seen was his 1934 Aero Morgan developed from MWMP 224. John has improved the gear change mechanism but is still working on the gearbox and engine valve cams. 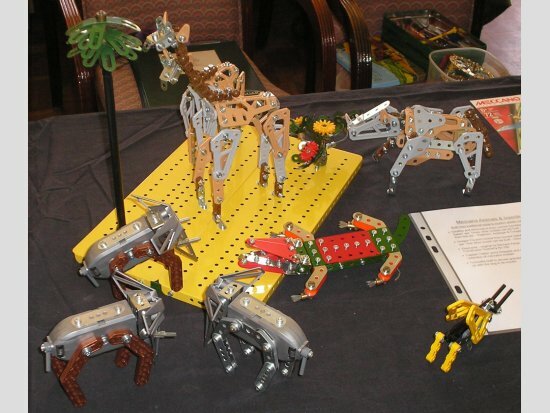 He also had a new display of Meccano Animals and Insects. John sometimes works on simple models as a contrast to current work he may have on challenging models. David Hobson. Model T Ford in medium red / green. David has created a clear demonstration of all the mechanisms and their controls with excellent detailing. He says that the car was simple to drive and that pressing any of the three pedals or pulling the lever would slow or stop the car. It has a two speed and reverse epicyclic gearbox. Many aspects of the design, which are presented very clearly in the model, seem very strange to modern eyes. David again brought his Tronico Junkers 52 but, since the last meeting, he has acquired two further Ju52 kits from which he has modelled a very authentic looking Lancaster to the same 1/50th scale. 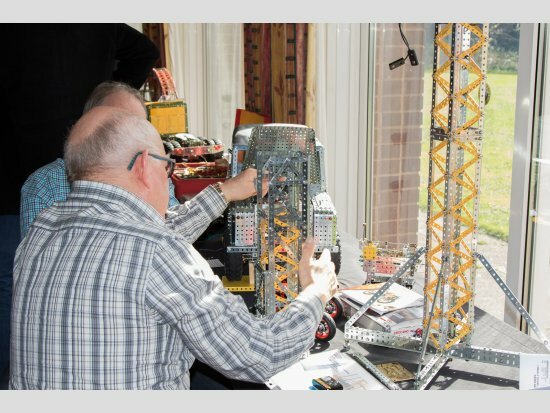 He has scratch built a cockpit structure on similar lines to the Ju52. The two models compare very well and have a very striking appearance. David feels that some of the Tronico wing parts are particularly effectively designed and it would not be possible to build credible Meccano models to such a small scale. Mei Jones (seen left being quizzed by model reporter John Rogers.) Floating Crane in medium red / green developed from the 1954 to 1961 Number 9 set model 9.2. Mei has enhanced the appearance of some key parts of the model with some yellow and black parts from later eras. Mei explained that he has been modelling since about 2009 and he commenced building his Floating Crane in about November 2016. Brian Edwards. 1913 Morgan Quadricycle is a very nice small model developed by Brian of a 4 wheel car. It has detachable bodywork and the full chassis and mechanism layout are very clear. The authentic looking wheels have thin black repro tyres. 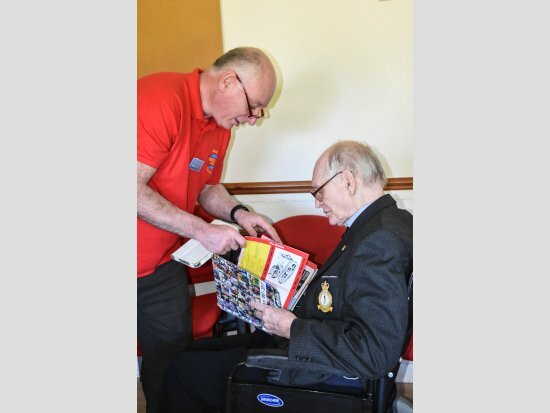 Brian is one of the longest serving members having joined MMG in 1969 at its third meeting. Pete Evans. 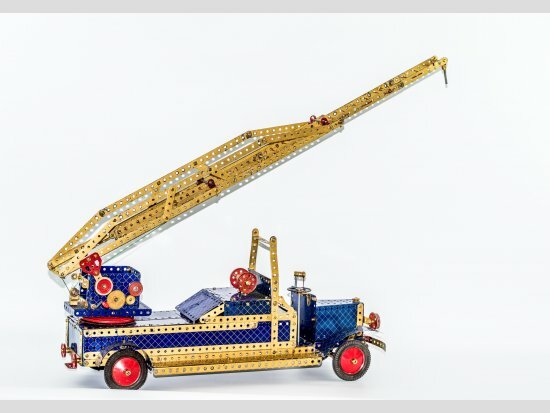 Two blue / gold models from the 1939 Manual – 8.6 Fire Engine and 8.11 Tipping Motor Lorry. Both models are a similar size at 1/12th scale and together are a very handsome sight. Pete built these models during 2016. 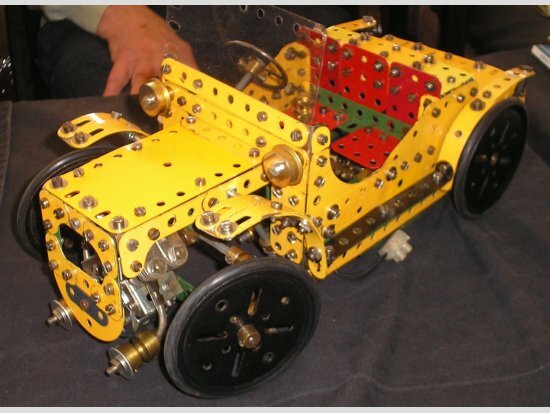 He explained that blue / gold is his favourite colour and this was the colour of his first Meccano. He recollects that when he was aged 12 he would earn money for small jobs for his family so that he could save up to buy Meccano parts. 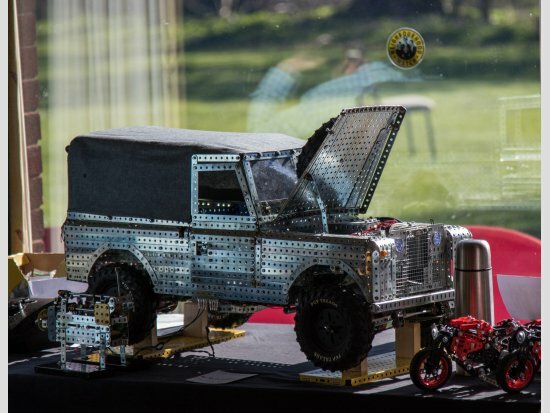 Neil Bedford demonstrated his remote controlled Camel Trophy Land Rover which he built for Skegness 2016. Neil is very much an expert at remote control handling. It was a delight to see this powerful small model performing with its tight turning circles, fast speed, bright lights and generally rugged appearance. Richard Howard. Mars Orrery from Michael Whiting’s 2005 Model Plan 163. The model shows the movement of the two moons Phobos and Deimos around Mars. Richard found that the model plan was clear and very good and the model was fairly quick to build. The relative speeds of the two moons are set quite accurately. Terry Wilkes is currently working on a 50 parts model for the anniversary 50 part competition, he calls it simply - a Walking Object. 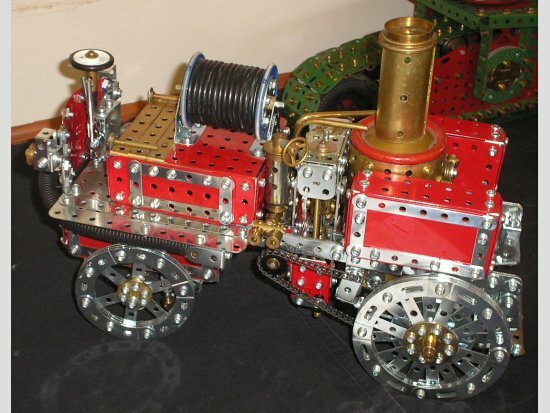 It has a clockwork motor driving a leg mechanism which he has designed. 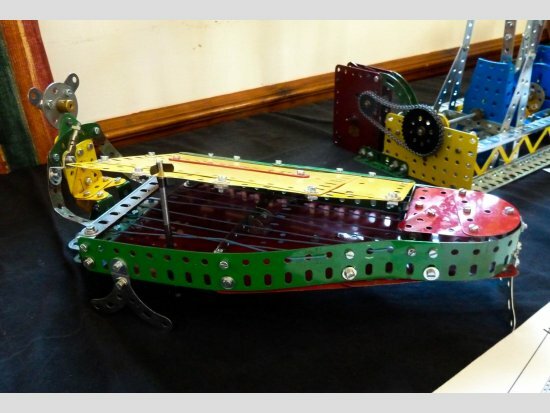 The relatively heavy weight of the model, some friction and short duration of the motor because of the significant step down in the driving speed has resulted in several problems which Terry promises he will sort by July. 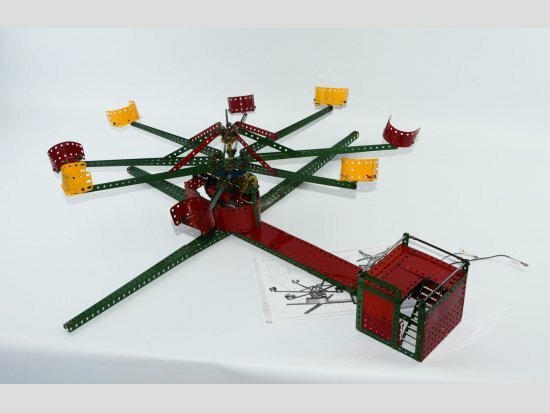 Carl Gill displayed a Big Wheel modelled in medium red / green. The wheel has eight cabins. Dave Bradley had a very large display of yellow / blue models from the 1974 outfits. Dave has made for an exhibition a model from each outfit - from Pocket Meccano to set 9 and he is intending to build a model from the Number 10 set. All the models are exactly per the instructions and, apart from the very smallest, they are of road vehicles. 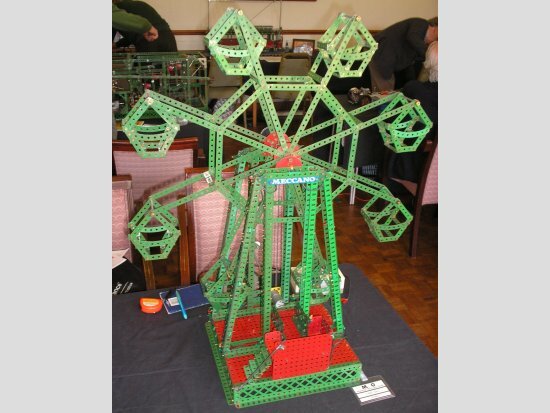 Greg Worwood bravely displayed his plastic Meccano Windmill which is based on the 300 / 400 set. Greg confirms this “to be a typical Binns Road model that is structurally unsound and does not work. I find it difficult to believe this was intended to be assembled by a young child”. Greg spent much time modifying the design. The model is indeed something of a horror. The colours are crude and many of the parts are ugly. Noticeably, of the 201 images of the MMG 100th meeting posted at the date of writing on the NZ site, nobody had included Greg’s model. (There are 2 photos of this model now added to the NZ site, also now a total of 310 images from the meeting posted by Bob Thompson). Stephen Wilson. Stephen, brought Oil Tanker from a 1922 No.5 set, and also a Naval Frigate from a 1949 No. 6 set. 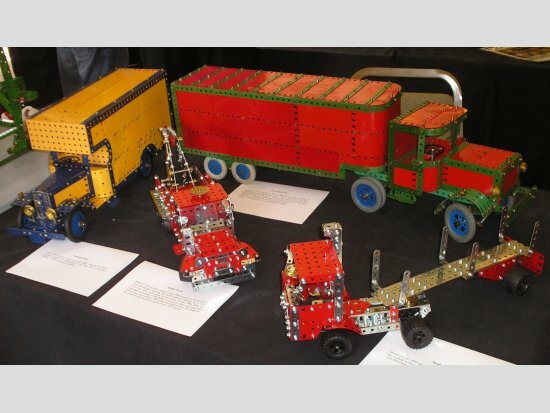 These models made from well used, and some might say distressed, Meccano parts were never-theless well made and interesting to see made up. (Stephen’s models are seen left alongside another view of the plastic windmill). 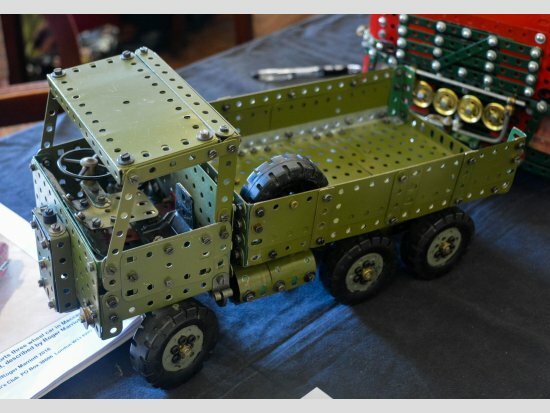 John Palmer displayed his Army Truck built with Army green parts seen at the last meeting. 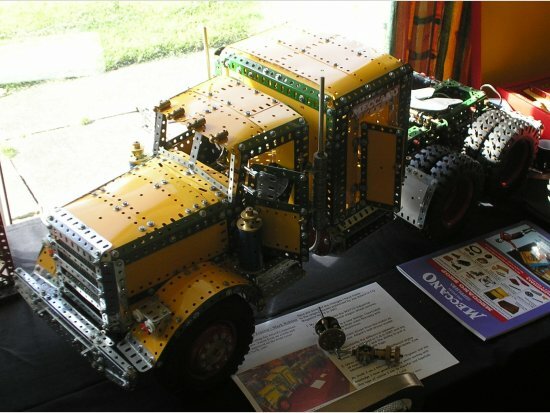 John was also displaying his latest model which is not yet completed, the chassis of a Thames Trader Lorry. Roger Marriott has now completed the model of Terry Pettitt’s 1934 Aero Morgan , as described in his model plan (MWMP 224). This lovely three wheeled sports car is now available as a model plan and is clearly proving extremely popular. With simulated valve gear, working tappets, realistic bodywork and a host of mechanical intricacies, it really is a superb piece of work. 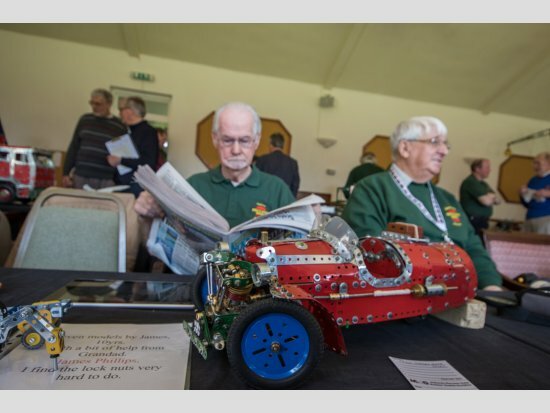 The model was recently displayed at a local club meeting where Roger was approached by a member of the Morgan Three Wheeler club. After admiring the model he commented the he did not think it was the “super sports aero” as this version, offered 1922-32 has a two speed gearbox, “beetle” back and low level exhaust pipes, without the spare wheel mounted on the rear. The version most like the model is the 1933-39 three speed “super sports”. 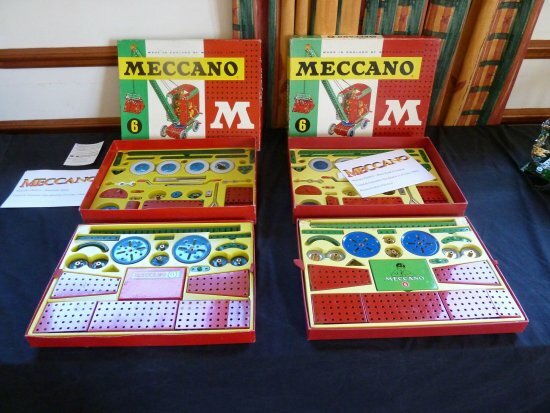 David Shirt displayed a fine example of the first ‘coloured’ Meccano with a 1926 Set 6a – perhaps the rarest example of the pre-war ‘big sets’. Dave Phillips. Aero Morgan Super Sport which is closely based on the Terry Pettitt 224 model plan. Dave is very pleased with the result although the model was very hard to build. The model now completed has been enhanced with a cam which Dave obtained from Stuart Borrill. The cam provides a very efficient demonstration of the entire push rod mechanism which the model features. Dave runs his model from a 12 volt battery from Maplin. James Phillips. Dave’s grandson was again displaying his collection of small set models. 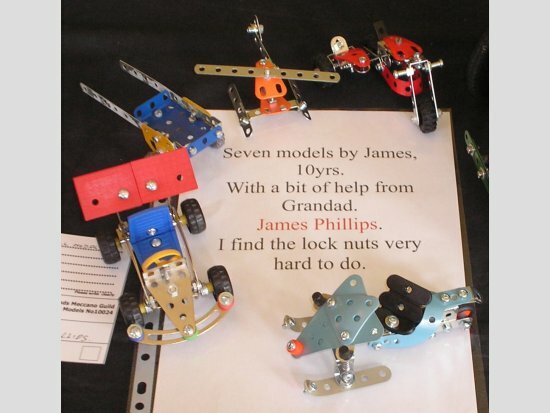 James enthusiastically discussed some of his experiences in building these models which, as always, can have unexpected complications. He found the lock nuts were a difficulty. Towering over everything else was Richard Payn’s very impressive Sobemai balance crane in red & green. (The crane is seen on the upper left side of the picture above). 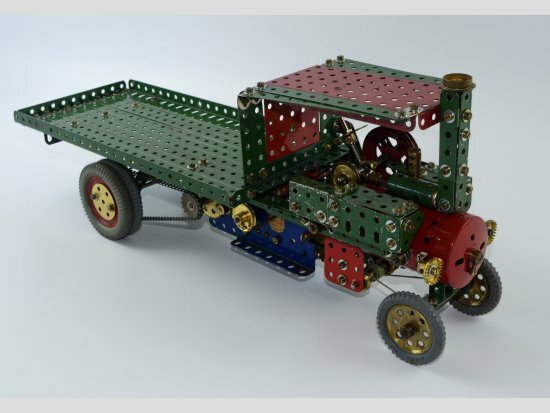 The caterpillar tracks, with each tread linked to the next by Meccano hinges, were especially interesting. Richard has used modern parts in the grab, has now got the drive, steering and slewing actions working and will soon crack the luffing of the beautifully balanced jib. 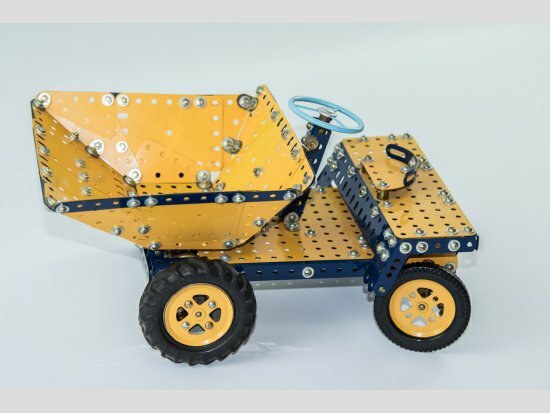 Richard Smith brought along a small but charming rendition of a Wingit dump-truck in late seventies dark blue & yellow parts, inspired by childhood memories of these vehicles and the chance find of a pair of chunky nonMeccano wheels which look perfect on this model. 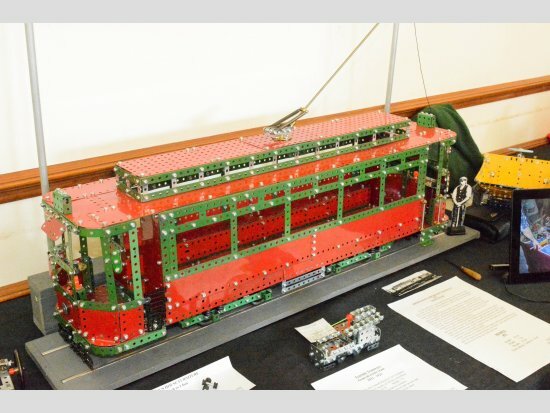 Geoff Devlin showed his fine model of a Birmingham single-deck tram in red & green parts with a scale of 1" to the foot. The prototype began life in 1903 as a double-decker, was then converted in 1917 to a single-decker and finally converted back to a double-decker in 1926! Geoff also brought us another tram, this time a clever use of parts in readiness for the ’50 part challenge’ which will be held at the next MMG meeting. 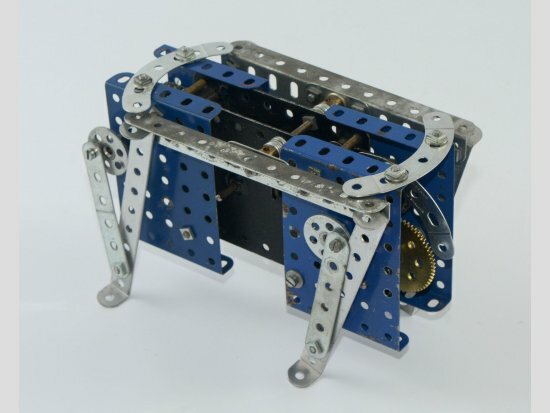 Geoff also showed some doll’s house furniture which must rank as two of the simplest Meccano models ever seen – the piano stool using just 4 pieces! 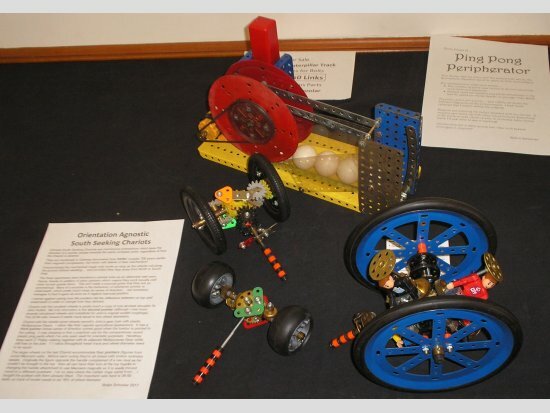 A variety of orientation-agnostic southseeking chariots were shown by Robin Schoolar, along with his excellent ‘Ping-Pong Peripherator’ which was created in response to a challenge by the Runnymede Meccano Guild to build a 30 piece model for its recent 30th anniversary meeting. 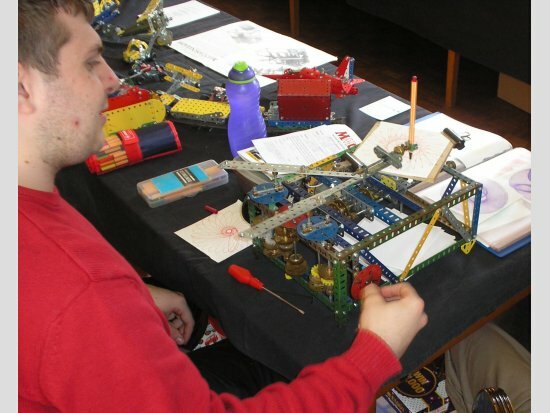 New member Pete Austin delighted us with his version of Eric Baldwin’s Meccanograph (as shown in the April 1991 MMG gazette). Pete also brought models of a Sopwith Camel, Red Arrows jet and an ‘O’ gauge train built by his father. Just for a change, George Illingworth had a pair of fire engines on display. This time we were treated to a 1904 Merryweather Fire King and an early self-propelled steam pump, both modelled very effectively in red & zinc parts. 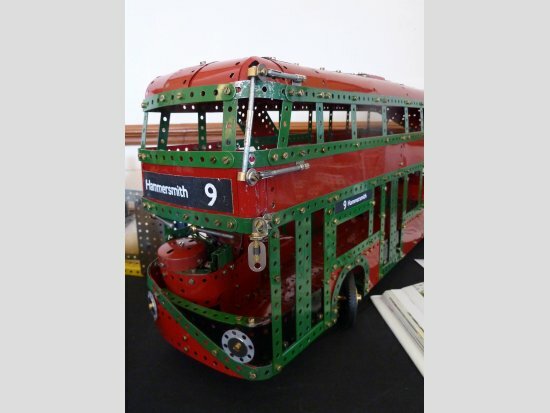 Geoff Wright delighted us with his curvaceous model of the ‘Boris Bus’ built strictly from the contents of a No.9 Set, once again showing his characteristically clever choice of parts. 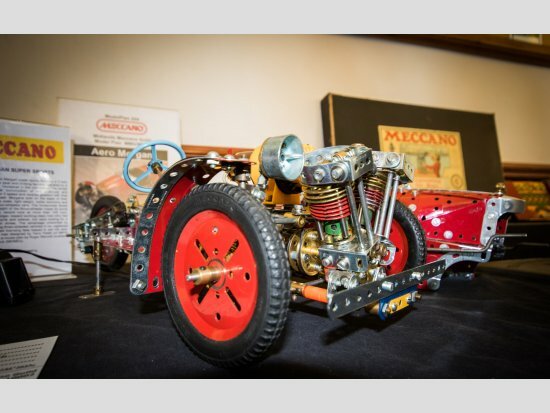 Tom and Matthew McCallum delved into their collection of rare items to give us all a fascinating history lesson, beginning with a pair of No.1 Constructor Cars, one English and one French. Close inspection showed a great range of minor differences between the two versions, confirming that they must have been made using quite distinct tooling. A boxed GRB from 1945/46 was a real rarity, produced in the medium red colour as a special order by Binns Road. As if this was not enough, the lads also showed an original 7 ½” roller bearing which never reached full production. 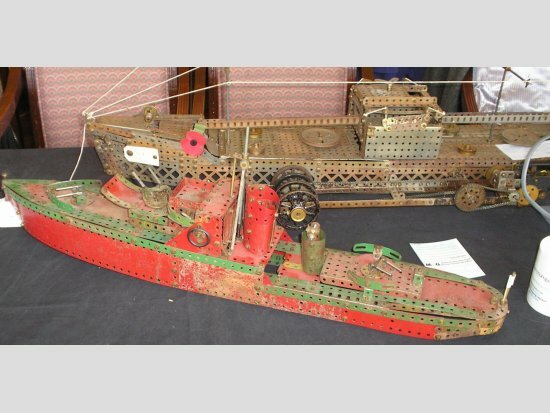 A pair of clockwork speedboats was next, in quite astonishing condition. One was the ‘Gleam’ in civilian colours and the other was the same model, but rebadged as the ‘X46’ and sporting a naval paint-job. 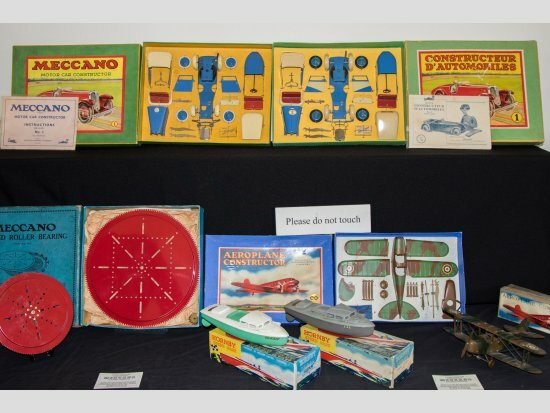 Still on the military theme, Tom and Matthew finished with a pair of 00 Aeroplane Constructor kits from 1939 and 1941 in two different camouflage schemes. Both had their packaging (of course! ), one of which was the original ‘austerity’ box and represented the last things made at Binns Road before the factory was turned over to munitions production. 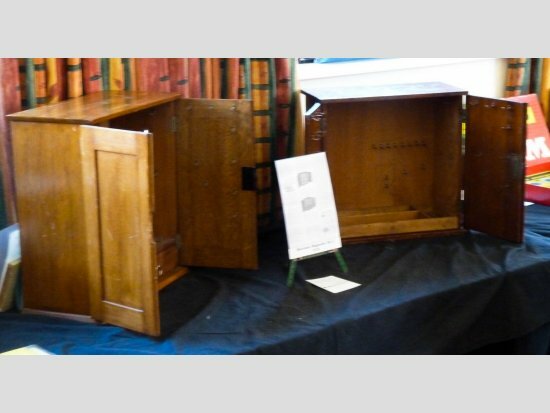 Continuing the early Meccano rarities, Jim Gamble displayed a No,1 and No2 wooden storage cabinet, in very good condition and as advertised in Meccano Magazine No.2 in 1916. A tidy 4 tracked tractor with towing drill, also a flying planes model (seen left) was shown by Michael Bent. Richard Gilbert showed us two contrasting No.6 Sets, an English version from 1963 and a Spanish version from 1964. Whilst both were essentially red & green, the shades differed, the various wheels in the Spanish set were painted blue and there was a noticeable difference in the overall quality of the finish – naturally with the English set being superior! 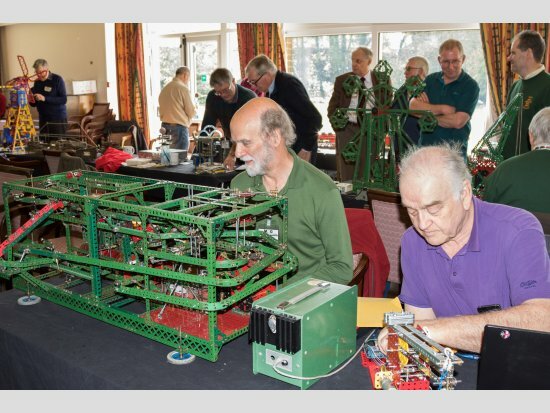 A range of models was brought along by Trevor Batten, including a Piano Player, a Cakewalk funfair ride and a YBZ Marine Engine (model 6.12). 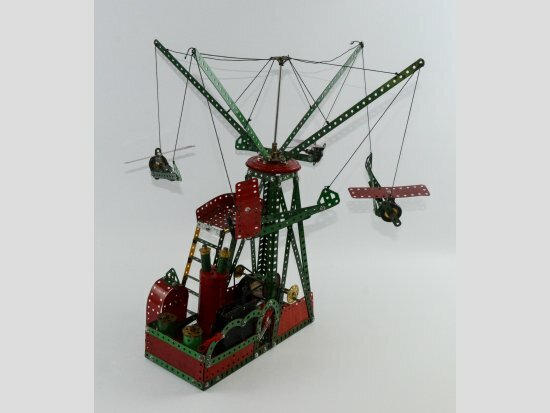 Tony Horton has built an impressive container crane and ‘ship alongside’ to his own design in red & green parts. 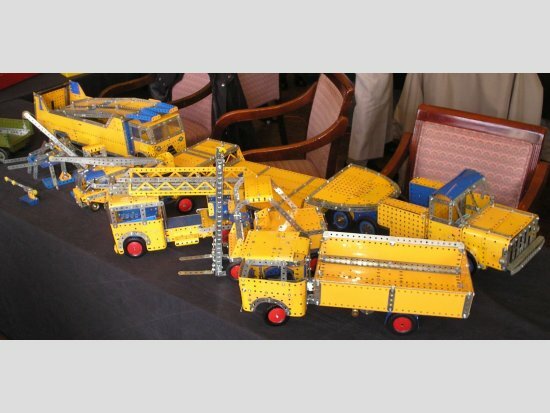 A range of very cleanly constructed vehicles were displayed by Peter Hardingham, including a furniture van in dark blue and yellow (model 6.6), an articulated lorry in red and green (model 9.2), a crane lorry in English red and zinc and a timber lorry in French red and zinc parts. 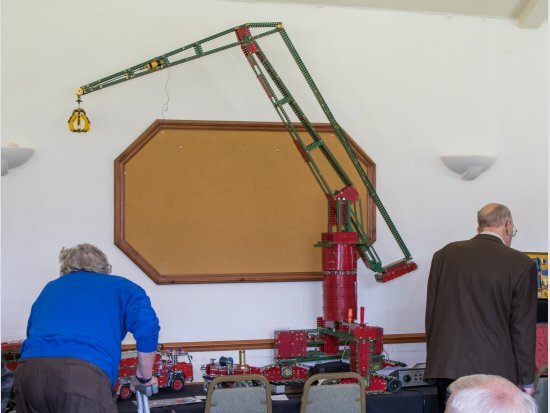 Another member with a fine range of models was Mick Burgess, who showed us a motor breakdown crane (model 7.6 of 1930), a horizontal steam engine (model 3.56 of 1931), a tractor with manure spreader (model 6.12 of 1962), ‘performing musicians’ from the Meccano Magazine for March 1950, a very neat TR3A sports car and finally a streamlined petrol tank lorry (model 7.1). 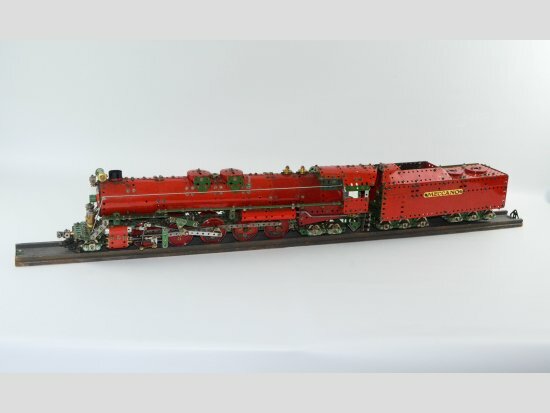 A lovely model of a 2-10-4 American steam locomotive, ‘The Santa Fe’, was displayed by Terry Pettitt with a great deal of detail packed into it. Terry who is another long serving member (joined in1972) has had this gem tucked away for around thirty years and it certainly deserved a trip out. A delightful steam wagon (model 4.60 of 1930) and a modified version of model 7.11, the London Taxi, were shown by John Bland. Both models captured the spirit of their prototypes very well indeed. 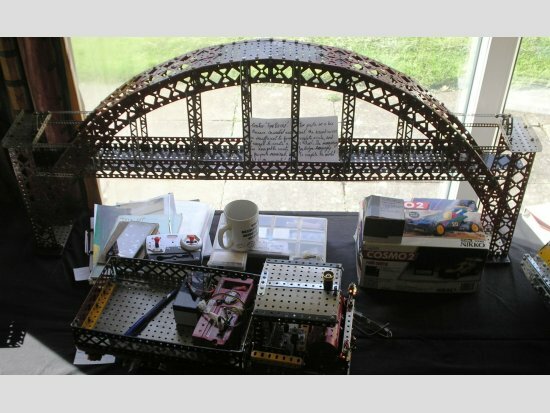 Colin Reid was next, with an Erector model of the Tyne Bridge, a Nikko r/ 18 c car and a marvellous 5 ton Yorkshire steam wagon to his own design. This was a very nice looking model but was further enhanced by being shown alongside the original handbook for the prototype vehicle, found at a car boot sale for 50p – amazing! A more modern lorry was the large ‘Peterbilt’ tractor unit built by Mark Rolston and based on a similar build by Joe Attard. This fine model, in the unusual colour scheme of yellow and green, features a huge amount of detail including working clutch and gearbox, three differentials, sleeping compartment with bed, television and so on. Mark also showed a very nice No.9 Set from 1947 with a very skilfully reproduced box. Charles Catt showed a frame for embroidery but we didn’t manage to catch Charles to talk to him about the model. John Hornsby has another crane under construction – a Liebherr tower crane featuring a roller bearing using ‘Delrin’ balls in place of metal ones, which avoids all wear and tear to the rotating parts (as described in the last MMGB). John also took a rare diversion from cranes with a tidy pair of Ducatti 1200 motorcycles built from modern kits. One of the largest models shown was a Series 2 Landrover on 6” wheels by Christopher Dove, at his first meeting as a new member. This model featured a fully detailed engine and interior, working clutch and gearbox and was very neatly clad using zinc strips. Chris has provided the following details: The model is inspired by a Series 2 Land Rover from the early 60’s. It is built to approximately 5th scale, this being determined predominantly by available tyre size and the need to accommodate the driveline within the standard Land Rover 88” wheelbase. The model has deviated from standard just a little as I have installed a larger V8 engine as future plans are to make it look more like an off-road 19 competition vehicle complete with roll cage etc. The Chassis closely follows the real thing being of box section construction with various cross-members and outriggers and includes conventional multileaf springs with shock absorbers. The Steering incorporates a miniature version of the real steering box which transfers movement to a drag link, steering idler and track rod; an almost exact representation of the real thing. The engine is a Rover SD1 lookalike with a Meccano 6 speed motor inside. The motor speed is controlled by the throttle pedal. Drive is then passed through a conventional spring type pedal operated clutch. The gearbox is 5 speed and reverse with a spring loaded gate change gear ever. Drive is then passed through a 2 speed transfer box with selectable front wheel drive. The rear output of the transfer box carries an expanding drum brake operated by a ratchet hand brake lever with push button release and also the footbrake pedal. From the transfer box, drive is passed to front and rear axles incorporating conventional crown wheel and pinion differentials. The front axle incorporates small universal couplings in the steering swivels. Dashboard mounted switches are included for headlights, sidelights and functional flashers. Brake lights are also included with some electronics to allow the single tail light bulbs to increase in intensity when the brake pedal is pushed. The button on the steering wheel boss also operates a horn. 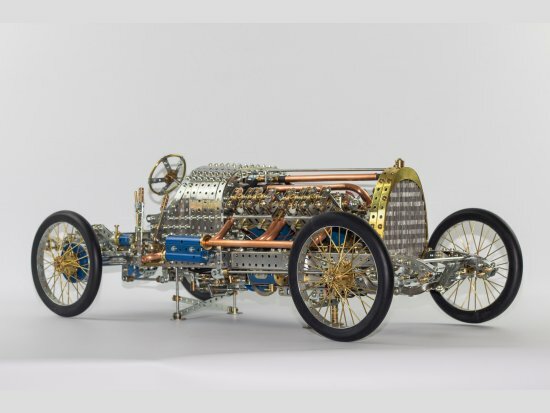 The Bodywork is built almost entirely from Meccano strips, although some have been cut to non-standard lengths due to construction limitations, and a couple of special parts have been fabricated to fill in the unsightly gaps at the front wing corners. The interior has been modelled to follow as closely as possible the standard layout for the dashboard and controls. The model incorporates a removable handmade canvas tilt cover secured by string ties 20 over a steel frame made from old bent Meccano axles. The model weighs 15kg and has dimensions 750mm, long x350mm, wide and 380mm high. 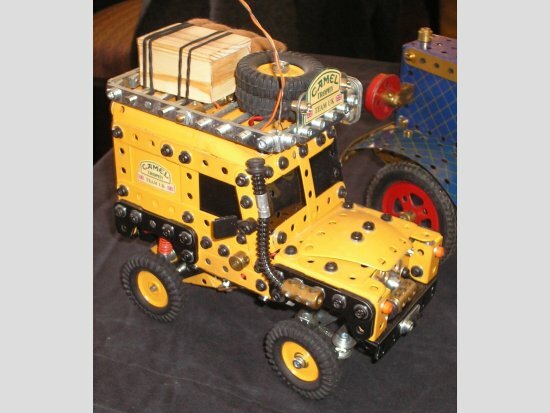 Alan Scargill has completed the chassis of a ‘4x4x4’ vehicle – that is, four roadwheels, four-wheel drive and four-wheel steering, based on an American ‘Hummer’ style prototype. This is Alan’s own design and has some clever features. 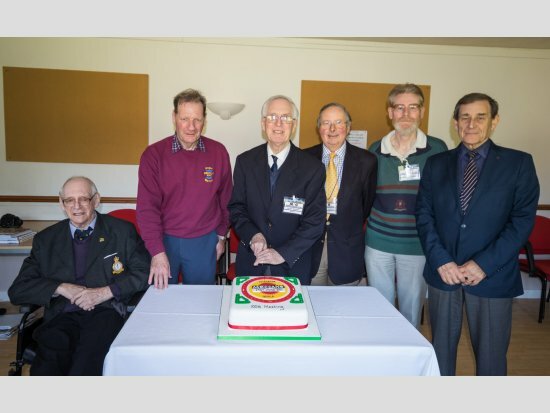 AND finally the cake cutting was ceremoniously done by the president Geoff Wright, supported by the committee and attended by the two founding members present, David Goodman and Jim Gamble. However the really hard work was done by our kitchen ladies supported by Alan Scargill in his professional capacity as head cake cutter.